New-look Digital Camera magazine out now! The new issue of Digital Camera magazine is on sale now (as well as arriving in subscribers' postboxes), and it's the ultimate summer photography package. The big news is that the mag's had a major makeover throughout. With an all-new One-to-One pro masterclass kicking off the issue, followed by a huge practical photography tutorial series to inspire and help you improve your shots. Elsewhere, you'll find a new 16 page image-editing section, we start a new complete guide to modern photography, Camera College, and fresh takes on regular favourites including Shootout, Photo Answers, and gear section, KitZone. Editor Ben Brain kicks off a new regular series, The Art of Seeing, revealing how and why he makes an image, and Chris George serves up a fiendish new quiz to test your knowledge of photography. 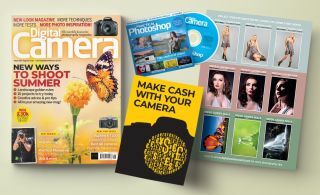 Plus, there's a free 36-page supplement revealing exactly how you can make cash with your camera – from how to get started in wedding and portrait photography, to selling your images through stock libraries and getting them published in magazines. On the free videodisc you'll find 15 Lightroom and Photoshop presets, 70 minutes of step-by-step video tutorials, and the latest 164 page Camera Shopper gear eBook. The original and best photo tips cards also return, with 9 all-new creative tips and portrait posing cards for you to start collecting. You'll find details of how to enter the Digital Camera Photographer of the Year competitions, featuring a total prize fund of £30,000. Plus, every month with the magazine you'll receive special codes that give you an extra free entry for the live categories. This month's cover feature reveals the 10 rules for summer shooting, and you'll find inspiration and advice from legendary photojournalist Steve McCurry and filter maestro Jeremy Walker. Finally, this month in the gear section we test eight cameras with 4K video, the Fujifilm X-T100, Canon EOS 2000D, portable drives, instant cameras, and the Laowa 9mm f/2.8 prime. Digital Camera is on sale now in all good newsagents and as a single issue here for the normal price of £5.49. To make sure of your copy every month, and get even more free gifts, subscribe at our online shop where you can get each issue for just £4.04!